Handwoven Alpaca Blend Cosmovision Tapestry from Peru, "Vision of the Harvest"
By Peruvian artisan Inka, this beautifully-detailed tapestry is inspired by pre-Hispanic cultures. 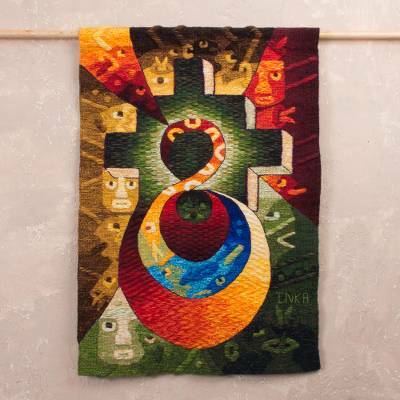 At the center, the chakana, or Inca cross is depicted, surrounded by imaged of faces and animals in a variety of colors. Inka works on a traditional loom, diligently hand-weaving the tapestry of alpaca blend yarns.